On Friday, September 21st , 2018 at 10:00 am, Degree Conferment Ceremony of September FY2018 took place at School of Material Science Lecture Hall. A total of 61 students:39 students in the Master's program [School of Knowledge Science; 4 students, School of Information Science; 6 students, Graduate School of Advanced Science and Technology; 13 students (School of Knowledge Science), 10 students (School of Information Science), 6 students (School of Materials Science)] and 22 students in Doctoral program (School of Knowledge Science; 10 students, School of Information Science; 10 students, School of Materials Science; 2 students) received their degree. 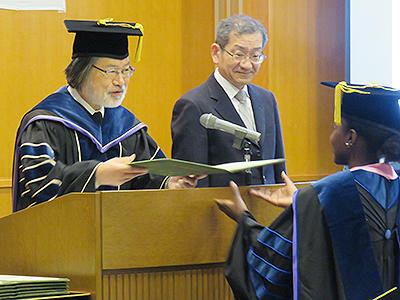 Each student received the degree from President Asano, and they shared handshakes with the deans and the supervisors. 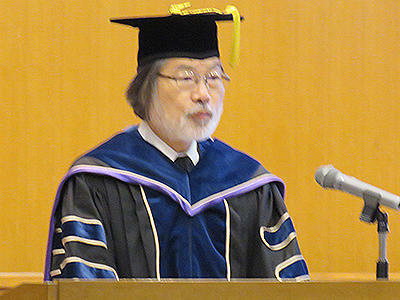 President Asano encouraged the graduates saying, "I believe that innovation has become the most important concept today, and it requires possessing unique ideas different from others'. For that sake, it is important to mingle with people who have been raised in completely different environment from yours and have a room in your mind all the time. I strongly hope for every one of you to become a great leader who can contribute to the materialization of best development of society and company through the experience of studied in global environment of JAIST. I wish you all good luck."